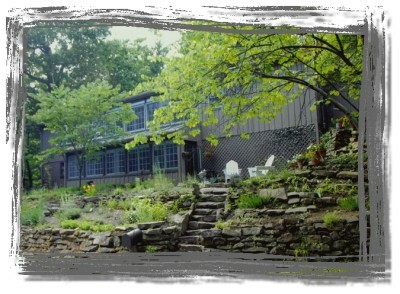 Welcome to this charming Brown County getaway overlooking the valley of peaceful Greasy Creek. This rental home has everything you need for the perfect stay away from home. 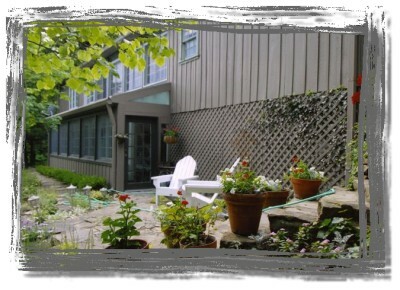 It’s a relaxing home perfectly suited for couples or even women looking for a girl’s getaway weekend. The two-bedroom and two bath rental has a fully-equipped kitchen and two separate dining areas for entertaining or scrapbooking. Both bedrooms have full size beds. Relax in the living room. But guests rave most about the enclosed sunroom that makes you feel immediately at ease with its country charm and ever-blooming flowers. Sit back on the porch’s comfy chairs and take in the views of the panoramic gardens that attract hummingbirds, butterflies, and other unique Brown County wildlife. And once guests have had a chance to unwind and relax, they can head to the village of Nashville just four miles away for shopping, entertainment, and dining. Then return home, make a cup of coffee, and sit back and relax outside on the patio and take in the Brown County ambience. The on-site owner, respectful of your privacy, is available for those who want sightseeing tips or restaurant recommendations. And, make plans now to stay longer than you were originally thinking as you’re not going to want to leave once you’re here! Home’s Amenities •	Two full-sized bedrooms and bathrooms •	Accommodates four people •	Fully-equipped kitchen •	Two full-sized dining areas •	Beautiful enclosed sun porch •	Grill and patio just off sun porch •	Satellite TV, VCR and DVD players, CD player/radio •	Wi-fi Internet •	Central air/heat •	All linens provided •	No smoking inside but convenient outdoor access with seating •	At this cabin charocal grill, charcoal and lighter fluid provided, toilet paper, paper towels and bath soap provided.